Introduction – The Global Operative Assessment of Laparoscopic Skills (GOALS) is a valid and reliable measure of basic laparoscopic skills in the operating room. 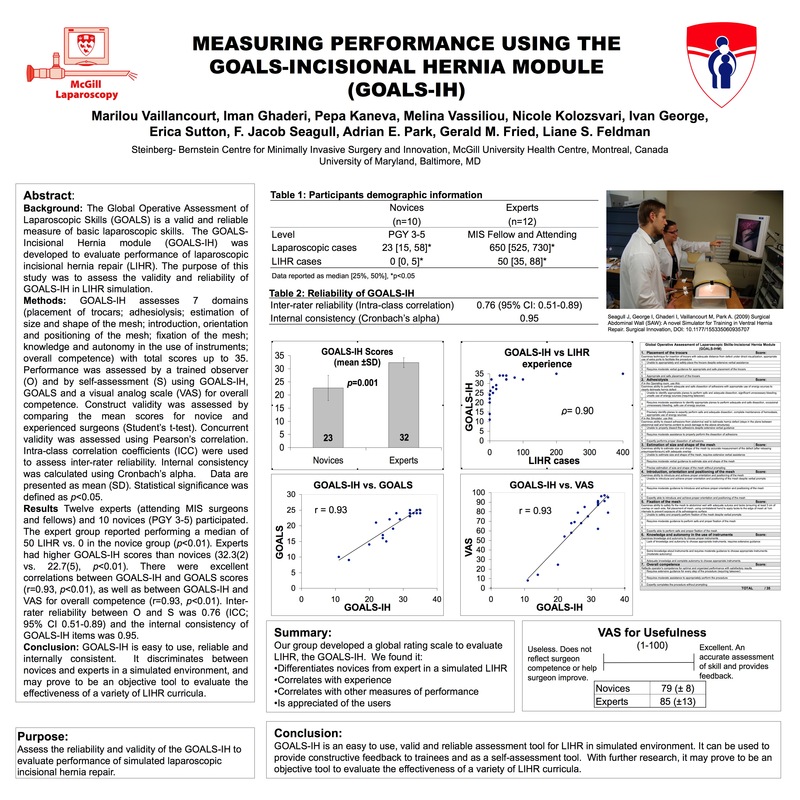 GOALS-Incisional Hernia module (GOALS-IH) was developed by expert surgeons to evaluate performance of specific skills required for laparoscopic incisional hernia repair (LIHR). The purpose of this study was to assess the validity and reliability of GOALS-IH using a LIHR simulator. Methods – GOALS-IH assesses 7 domains (placement of trocars, adhesiolysis, estimation of size and shape of the mesh, introduction, orientation and positioning of the mesh, fixation of the mesh, knowledge and autonomy in the use of instruments, overall competence) each scored on a 5 point Likert scale, with total scores ranging from 7 to 35. Participants provided demographic information and viewed an instructional video prior to assessment in the University of Maryland LIHR simulator. Performance was assessed by a trained observer (O) and by self-assessment (S) using GOALS-IH, GOALS and a visual analog scale (VAS) for overall competence. Construct validity was assessed by comparing the mean scores for novice and experienced surgeons (Student’s t-test). Concurrent validity was estimated using Pearson’s correlation. Intra-class correlation coefficients (ICC) were used to assess interrater reliability between O and S. Internal consistency was calculated using Cronbach’s alpha. Statistical significance was defined as p<0.05. Results –The expert group (n=9) consisted of attending MIS surgeons and fellows. Senior general surgery residents (PGY 3-5) were considered novices (n=9). The expert group reported performing a mean of 51(±27) LIHR vs. 3(±7) in the novice group (p<0.01). There was a significant difference between novice and expert GOALS-IH scores (22.4(±7) vs. 32.3(±2, p<0.01). There were excellent correlations between the GOALS-IH and GOALS (r=0.94, p<0.01), as well as between GOALS-IH and the VAS for overall competence (r=0.94). Interrater reliability (between O and S) was 0.74 (ICC; 95% CI 0.44-0.89) for GOALS-IH and 0.86 (ICC; 95% CI 0.68-0.94) for GOALS. Internal consistency of GOALS-IH items was 0.95. Conclusion – GOALS-IH is easy to use, reliable and internally consistent. It discriminates between novices and experts in a simulated environment, and may prove to be an objective tool to evaluate the effectiveness of a variety of LIHR curricula.